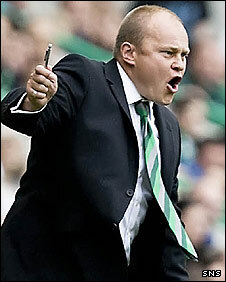 Hibernian manager Mixu Paatelainen has failed in his attempt to overturn a four-match touchline ban. The Scottish FA on Thursday rejected the Finn's appeal after he made a personal appearance at Hampden Park. Paatelainen was sent to the stand by referee Iain Brines during the Co-operative Insurance Cup defeat by Morton on 26 August. The Hibs boss had been angered by decisions during the Scottish Premier League club's surprise 4-3 reverse. Paatelainen disagreed with extra-time decisions to award the First Division side a penalty and a free-kick that led to Ryan Harding's winning goal. The Hibs boss then claimed Brines had sent him off for angrily throwing a towel to the ground, rather than for anything he may have said. His case had been postponed because Brines and fourth official George Salmond were unable to attend the original meeting. Paatelainen has already watched two league matches from the stand this season following his dismissal during a pre-season friendly at Cowdenbeath's Central Park. The latest ban comes into effect next week, following this weekend's visit to Celtic Park.